Give your French toast a nutty spin with this recipe, which coats the classic dish with heart-healthy almonds. This morning meal packs a good amount of protein and fiber to get you going in the a.m. In a small bowl, mix milk, egg whites, vanilla and maple syrup. Pulse almonds and cinnamon together in a food processor until coarse and place on a dish. 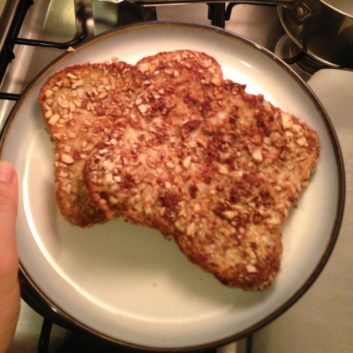 Dip each slice of bread in egg mixture for 10 seconds per side then coat both sides with the nut mixture. Coat a pan with nonstick oil spray and heat bread for 3 to 4 minutes per side. Serve with optional fresh fruit and a dollop of nonfat Greek yogurt on the side.